Traditionally, when talking about personal good fortune, the superstitious among us knock on wood to make sure nothing bad happens. 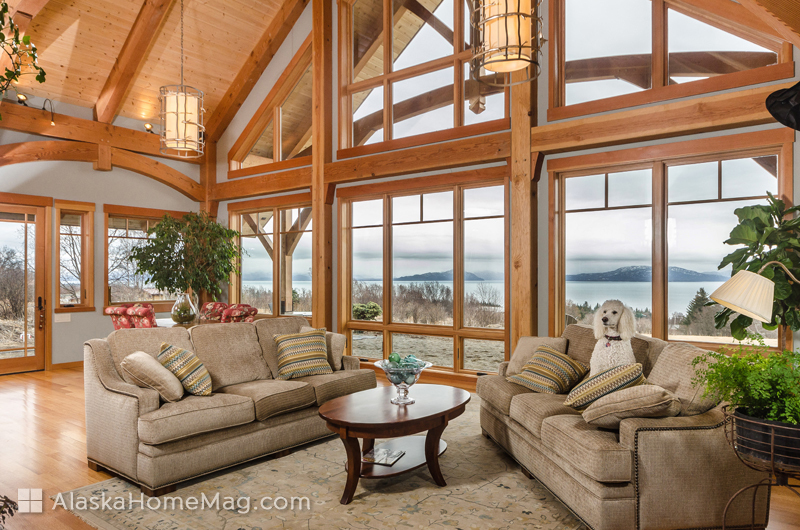 David and Karen Arzt aren’t particularly superstitious, but if either of them cares to ward off misfortune, they’re all set: Their Homer timber frame, designed by Colorado architect Judd Dickey and built by local contractor Kevin Strong, is floor-to-ceiling wood in blond-and-honey hues that fills the house with warmth. Judd Dickey, Mountain Timber Design, Inc.
“Timber frames afford those big, open spaces that we wanted, but the house doesn’t feel cold,” describes Karen, who had definite ideas about the kind of house she and her husband could build when they moved from Anchorage to a patch of land five miles outside Homer. 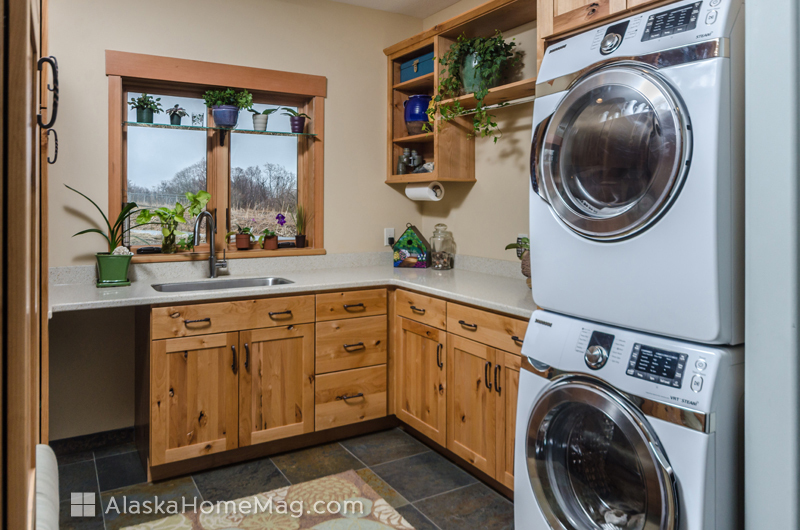 She loved the warmth of a wood home but she was a fan of contemporary style. And both she and David wanted something that would be for the long-term. “Our goal was to have basically one-level living,” David elaborates. The solution? 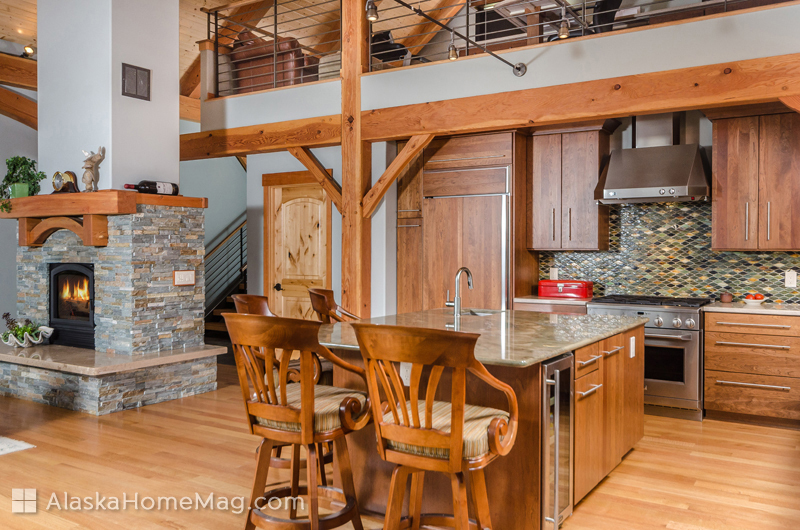 A timber-frame home that marries contemporary with classic and elegance with simplicity. “(The couple) took the step, which a lot of people won’t take, to go to a specialist architect in Colorado,” says Russ Walker of Alaska Timberframe. Russ had worked with Judd in the past and knew the architect could not only help the couple achieve their dream, but improve upon it with his thoughtful style and his history of designing Alaska homes. The generous roof gives the inside of the 2,700-square-foot home a spacious feel; despite a studio/office loft, the vaulted ceiling makes the great room truly great. But David and Karen kept the open floor plan from feeling “cold” by creating intimate spaces throughout the home – spots where guests can sit and chat or perch at the island while dinner is readied. 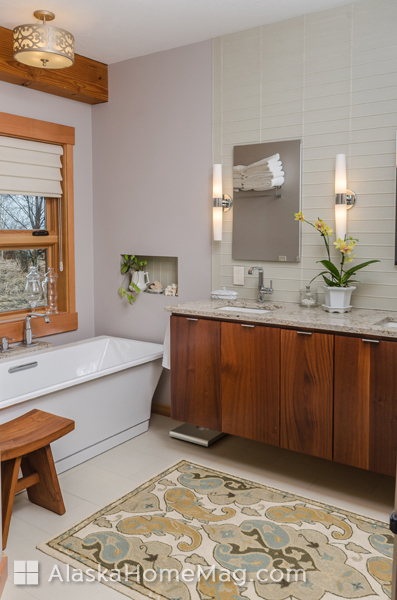 They also employed Karen’s fondness for contemporary style by choosing fixtures and finishes with a cooler color story that would contrast and highlight the warmth of so much wood. “We did a lot of stone and tile to accent the timbers,” says David. 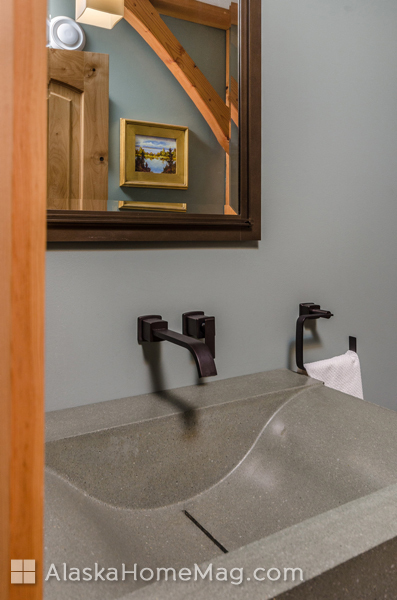 He and Karen traveled to Seattle to pick out granite for the kitchen island, and chose a unique, textured rock wall in the bathroom that echoes the stones used for the grand fireplace in the living area. An emphasis on airiness and lightness permeates the home. In the bathrooms, free-standing cabinets are mounted to the wall and seem to float above the tile floor. 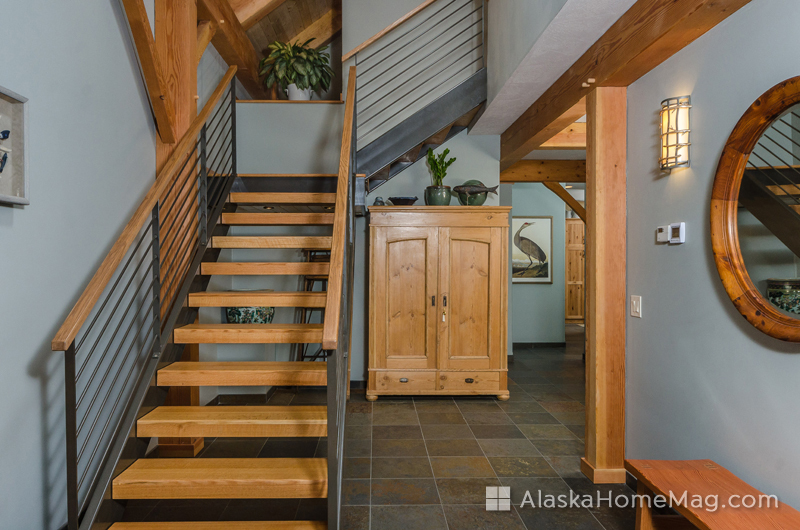 The slender railings on the staircase and the loft railing allow natural light to flood the home from huge windows that overlook Kachemak Bay. Outside, high-density steel siding fashioned to look like rusted steel gives the house a “lived-in look,” says Kevin. “Like the house has always been there. It’s a fantastic product from Arizona that also has great curb appeal.” Underneath, the structural insulated panels used in the home’s construction provide high energy efficiency. In the dark, it’s hard to appreciate smaller details like siding, but passersby can’t help but be awestruck by the sight of this home lit up against the night. Energy-efficient lighting designed by Jason Boyd of Shank Electric imbues the house with dramatic ambiance that has stopped neighbors in their tracks. “I told Jason I really wanted it to beam with light, and he did a great job,” says Kevin. 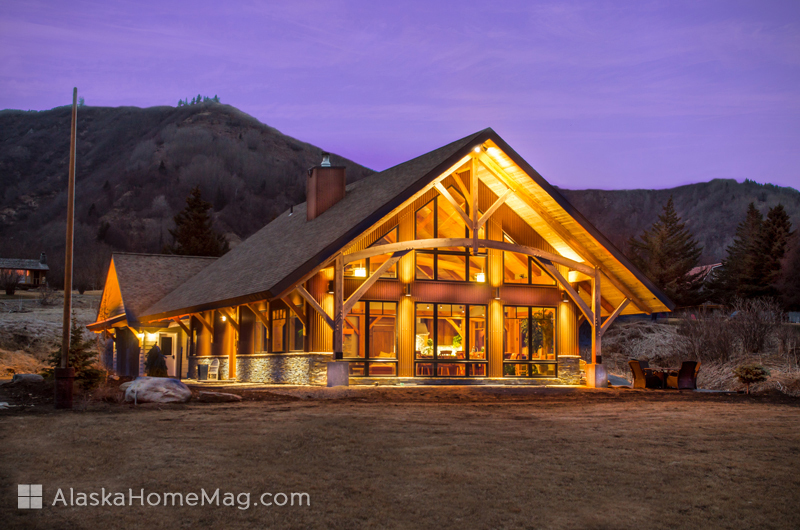 While the dramatic lighting makes the house stand out, the rustic siding and carefully selected timbers suggest that it has existed for years in harmony with its surroundings. The other big thing? The view. “It’s probably our favorite feature,” David admits. Judd designed the house with a natural flow that avoids unexpected turns or unnatural placements of rooms, and though he placed an emphasis on visible timbers, he also positioned them so they would accentuate – rather than take away from – the home’s magnificent view. “We highlighted the view in the design and positioning of the building,” says Karen. For David, the access to Homer’s spit and the nearby glaciers is part of what makes Alaska life livable.